He was her best friend. He is her current enemy. Still, he wants her and she wants him. And they're both stuck in their hometown...unattached. So she agrees to a truce. Two hours, once a week, no strings attached. Yes, each day they give themselves to those who need them. Every day—except for a few stolen hours on Wednesday. That’s when they take what they need from each other. But what sounds like the perfect arrangement, turns into so much more. 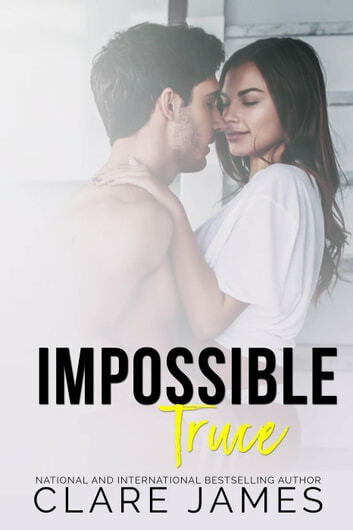 Impossible Truce, formally titled Two-Hour Truce, is a gritty and intoxicating stand-alone romance from Clare James that will keep you turning the pages no matter when you choose to indulge! The foundation written in these pages is amazing and really help the reader "see" who these characters are. This is done with such panache that the reader doesn't know it is happening. The story is beautifully written and I can not wait to read the rest of the series. Great book cought me by surprise, just had me stuck. Couldn’t stop reading.